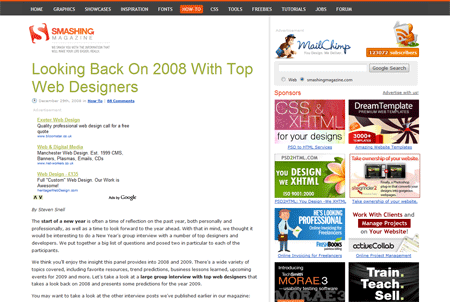 For my first interesting articles roundup of 2009, I have a great selection of posts from Dzine Blog, Lee Munroe, Smashing Magazine and ColorBurned. 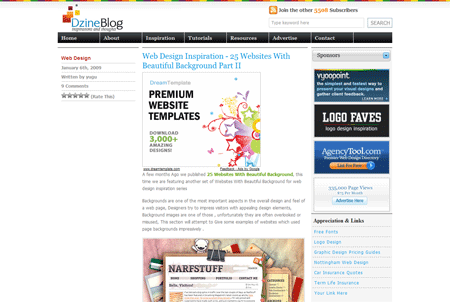 Topics include a range of web design inspiration and a detailed Illustrator pattern tutorial, check them out! This second half post from Dzine blog showcases a collection of web design inspiration in the form of 25 Websites with Beautiful Backgrounds. Included are some great examples of collage, distressed and grungey design styles. 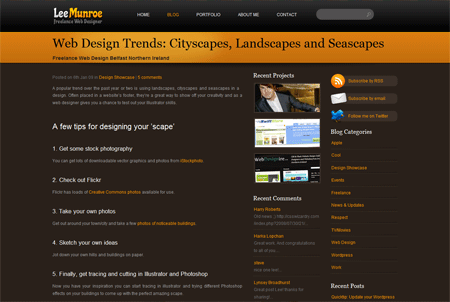 Lee Munroe highlights the emergence of a web design trend where Cityscapes, Landscapes and Seascapes make their way into website designs. Lee outlines some tips on creating your own 'scape' inspired design as well as featuring a large collection of inspiring examples. 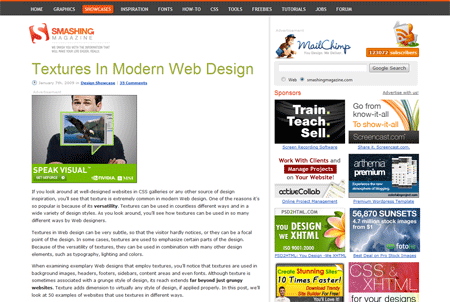 Continuing with more web design trends and roundups, Steven Snell of Vandelay Design recently authored this excellent post for Smashing Magazine; Textures in Modern Web Design. This epic article not only brings together a huge collection of examples, but goes on to list tutorials and resources for use in your own work. Following on from the first half of this Adobe Illustrator tutorial, Grant Friedman outlines the steps involved to create this highly detailed plaid pattern. Where part one created the main pattern tile, part two now finishes off the effect with extremely high attention to detail. I had the pleasure of being involved in a group interview over at Smashing Magazine late last year, where I present some of my opinions alongside some big names in the web design industry. Thanks for featuring my article at Smashing Magazine. This roundup 2009 is going to be stumbled now, its great! 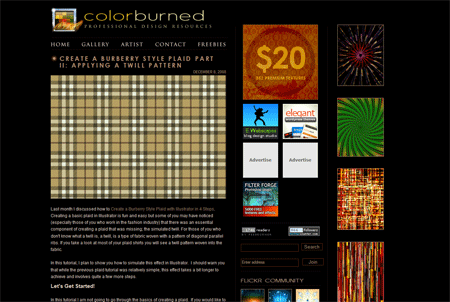 The plaid pattern worked well with Adobe Illustrator tutorial! Thank you so much for this post! I’m sure 2009 will be a great year for Spoon Graphics! Have a nice work! And thanks to help us all to be better day by day! Hey Chris, thanks for the link love. @Steven Nice article on Smashing! Good post! I enjoyed the sites.